Are you sick with dread yet? Have you rehearsed your excuse for getting off work Tuesday morning? We're less than 2 days from zero hour. That being Hotel Day, of course. By now you should have gotten the email from CCI with the link and phone numbers. There's no groovy instructional video this time, sorry. What's faster, the link or the phone line? No idea. It varies from year to year, and probably a number of variables play into it. I'd guess that people disgusted with or worried by Registration Day's server issues will be calling the phone lines. I did get my hotel that way one year, though it all felt very precarious (the operator was actually writing things down at one point.) Probably most of us will try both. Do I have to pay right then? No - you have to pay the two-night deposit when your confirmation arrives a few days later. If you choose to keep whatever hotel you've landed, of course. When will I find out what hotel I got? You'll get an email confirming your 6 choices within 48 hours. Between then and 1 March, you'll get your email notification with your assigned hotel on it. Do not freak out if other people start getting their confirmation emails before you; a few years ago, I was one of the very last people to get one, I even called Travel Planners and asked about it, and was told that probably meant I didn't get a hotel. Then I got my email with my #1 choice on it. What are the best hotels? 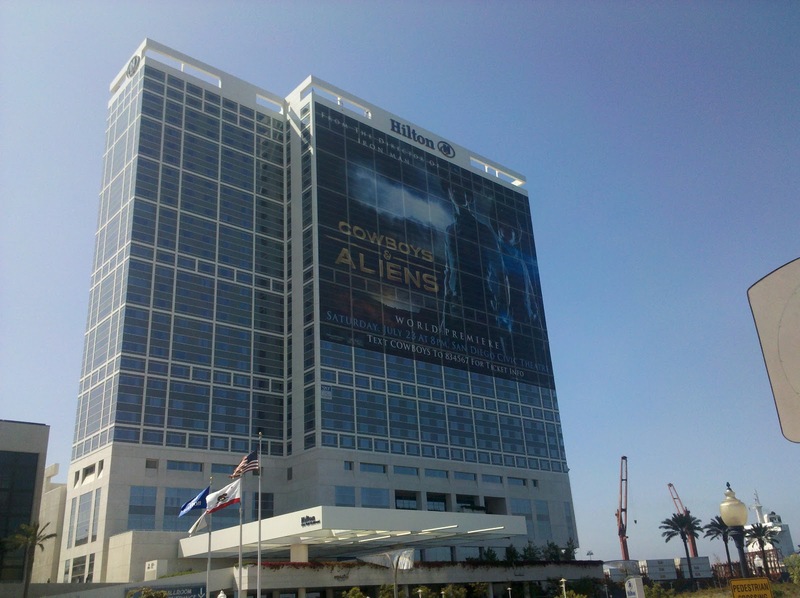 ~ If you want to go to and from the convention center frequently, staying close is the right option - Marriott Marquis, Manchester Grand Hyatt, Hard Rock, Hiltons Bayfront and Gaslamp, and the Omni. These are the most popular hotels as well as the most expensive and sell out fast. ~ If you want to be up around Horton Plaza and the upper Gaslamp Quarter, places like Westin Gaslamp, Residence Inn Gaslamp, Horton Grand and Marriott Gaslamp can make more sense than the hotels right by the Con. You can take the shuttle to and from the Con if you don't feel like walking (it's a short distance) and not have to travel far at night. If you want to stay right near a lot of restaurants, bars and shops, and save a couple hundred bucks, consider making these your first choice. ~ If saving money is your top priority, staying out at Mission Valley Hotels is the way to go - but only if you're going to stick to shuttle use and not spend money on cabs. ~ If you're picking hotels based on where you're likely to share an elevator with celebrities or see Marvel editors in the bar, don't bother. Also: don't be a princess about which hotel has the best gym or the coolest bar or nicest sauna. You really aren't going to be spending much time at the hotel other than sleeping. ~ Note that the rates listed on CCI's hotel page are "starting at" and will go up for bigger rooms and suites. Also remember to add daily parking charges (usually around $30/day) to the downtown hotel rates if you're bringing a car. ~ Finally, I'm going to repeat what I said earlier about not picking only the obvious hotels. You get 6 choices. That's it. If we all pick the same 6 close-by hotels, obviously the majority of us won't get in, which sets us up to get assigned some random hotel room in Siberia. It's probably smarter to hedge your bets with a mix of top-tier hotels and less-desirable-but-still-ok hotels. That way, if/when you get locked out of the more popular ones, you can still land somewhere of your choosing. If you're new to Hotel Day - yes, it can go as badly as Registration Day. I know you were wondering. Right now you're probably still basking in the afterglow of landing a Comic Con badge at all, but you should know that similar issues have dominated Hotel Day in the past: overloaded servers, complete meltdowns, rescheduled Hotel Days, people whose friends got a better hotel despite joining the system later, people who didn't get a room at all. However, the situation generally isn't as dire. Rooms keep opening up over the coming months, you can try renting condos, and of course there's the Early Bird sale. No matter what happens Tuesday, remember this: you are going to Comic Con this year. That alone puts you in a very lucky category.